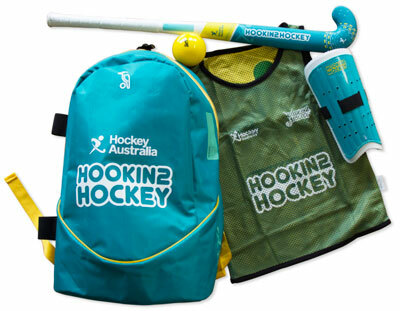 Hookin2Hockey is the national junior development program designed by Hockey Australia. Typically, Yarra Valley Hockey Club offers Hookin2Hockey on Saturday mornings during Term 1 (March). The program runs across an 8 week period. The sessions are targeted towards two age groups: players aged 4-6 years, and 7-12 years. (Please note that the H2H website says under 10, but we are very happy to cater to new players up to age 12 as well). It is suitable for all players aged 10 years and younger, and any players aged 11 and 12 years who are new to hockey. Skills sessions are taught within game frameworks, and the program generally culminates with a final tournament Carnival Day. Players wishing to continue can take part in Hookin2Hockey again, or transition to winter Junior hockey in either Under 8 (Stick2Hockey) or regular Under 10 hockey. To enrol in Under 8, Under 10 or Under 12, please visit the Junior Hockey page. A secondary objective of the program is to train prospective coaches in how to run skills sessions and manage game play. We hope that players enjoy Hookin2Hockey and will want to play in a Junior team during the next winter season. Hookin2Hockey registrations should be made through the Hookin2Hockey website. Click on Yarra Valley Hockey Club. Click on View Available Program Details. All registered participants will receive a Participant Pack delivered directly to their nominated postal address. Different Participant Packs are available for New Players and Returning Players. For more information, please visit the Hookin2Hockey website, contact Rachel Watson, or visit the Age Group FAQs.